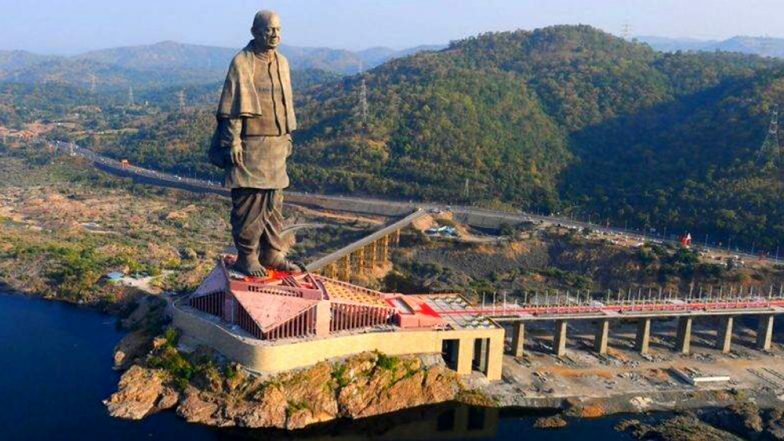 Gandhinagar, February 18: Terrorists are planning to blow up the Sardar Patel- Statue of Unity in Gujarat's Narmada district, according to an email. The Ahmedabad crime branch and ATS will together investigate the matter, though it is not revealed to whom was the mail addressed. The threat comes days after Pulwama terror attack in Jammu and Kashmir where 40 CRPF jawans were martyred and over a dozen seriously injured after an explosives laden SUV rammed into a vehicle part of CRPF convoy. The CRPF convoy was moving from Jammu to Srinagar and the attack took place in Awantipora. List of Jawans Martyred in Pulwama Attack: Names and Photos of 40 CRPF Bravehearts Martyred in JeM Terror Strike in J&K. Reports emerged on Monday that after the Pulwama Terror Attack, terrorists are planning to target the religious sites and railway stations in Gujarat. The ATS and the Ahmedabad Crime Branch (ACB) is looking seriously into the matter, said reports. Sardar Vallabhbhai Patel Gets 'Statue of Unity': 5 Things to Know About Iron Man of India. The Commissioner of police and police officials have also been put on alert, said reports. A large number of tourists have been visiting the Statue of Unity ever since it was inaugurated by Prime Minister Narendra Modi on October 31, 2018. The 182- metre statue is the tallest in the world. Over 8 lakh people have visited the site from November 1 last year, when it was opened for the public, till date, the chief secretary said. I K Patel, Narmada district collector and chief administrator of the Statue of Unity site, told PTI that the new time slots were decided upon keeping in mind the visitor rush expected during the summer season. An official around 7,000 visitors can view the memorial daily in the new time slot against 6,000 during weekends and public holidays in the earlier 9am-5pm period.